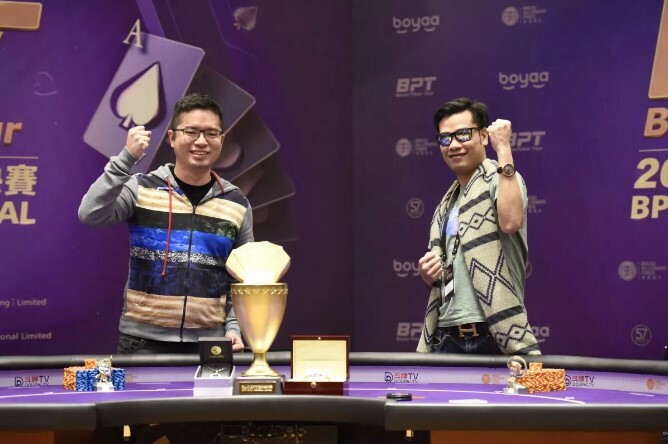 Taiwanese poker player Lin Hong Chang became the champion of the 2017 Boyaa Poker Tour Macau Final on Wednesday, Nov. 1, putting to an end the five days of poker tournament organized by Boyaa at the Babylon Casino in Macau. 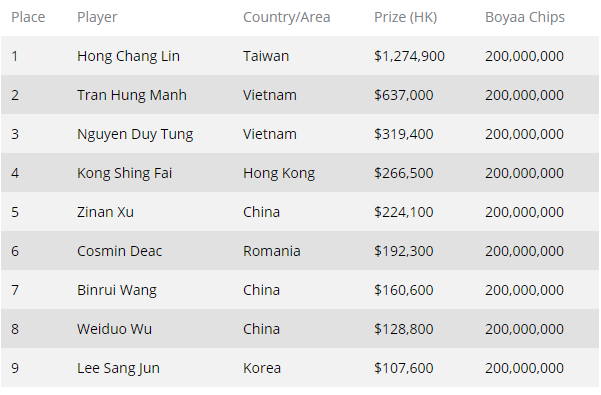 The final table of the 2017 BPT Macau Final started at 1:30 p.m. with nine players coming from Hong Kong, Taiwan, Vietnam, Romania, China and Korea, respectively. The final table battle lasted nine hours, and the eventual final heads-up duel featured Lin Hong Chang and Vietnamese player Tran Hung Manh. 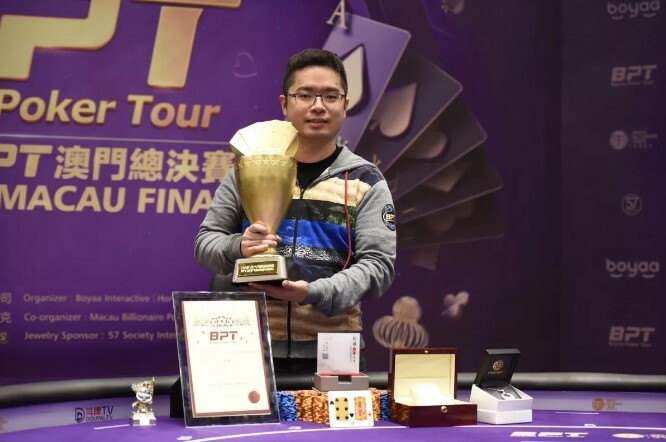 The cards prevailed for Lin, and he beat his last opponent to win the Final and become the legitimate owner of the HK$1,274,900 top prize (approx. US$163,418). Tran Hung went back home with HK$637,000 in his pockets. 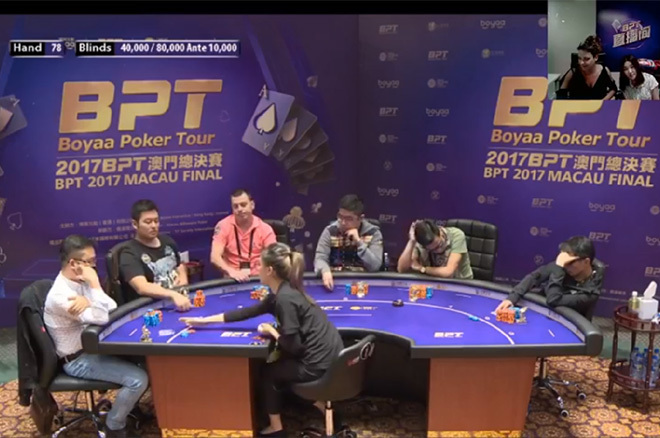 And with this, the 2017 BPT Macau Final came to an end in the Babylon casino. Lin Hong Chang, the champion, is longtime Boyaa player used Boyaa Poker's online games to polish his skills. In fact, as early as 2010 he joined the online qualifiers for the BPT and qualified three times in a row for the live tournaments. This was his fourth time coming to a BPT, so the happiness of winning the title was double for him since it was something he had been fighting for. After winning, he stated that he would keep attending BPT events. On the final hand of the tournament, with blinds at 75,000/150,000 and a 20,000 ante, Lin Hong Chang (9,635,000 in chips) raised from the button and Tran Hung Manh (5,175,000) called to see a flop of Both players checked bringing the on the turn. Tran checked, Lin bet 250,000, and Tran check-raised to 750,000. Lin called. The river was the and Tran bet 1 million. Lin raised to 3 million, Tran moved all in and Lin called. Lin's trip sixes took the pot and he was awarded the title, the prize money, and 200,000,000 in Boyaa Poker chips to use online. This BPT has set a new a milestone thanks to its biggest-ever prize pool so far, a record number of participants, and an incredible variety of events. All combined for a string of surprises that have this trip an unforgettable experience. Starting on July 1, 2017, with the online qualifiers, the BPT Macau Final reached its climax in the Babylon Casino of Macau from Oct. 28 to Nov. 1. The Main Event had 745 participants, a HK$6.7 million as pool prize and $HK1,274,900 for the champion. Aside from the Main Event of this BPT, there was also the 57 Society International-sponsored no-limit hold'em event, along with a deepstack turbo, Ladies Event and other activities that added even more colorfulness to the whole experience. This time, Boyaa Interactive, along with Facebook live and Douyu TV, Netease, Lesports and others, broadcasted the whole event. Players from all over the world could choose the best platform to watch this spectacular BPT. Following the conclusion of the main event and the success of the new champion, this 2017 BPT has come to an end. Boyaa Interactive will keep delivering the same professional tournaments to enhance the game experience for all our users. See you soon in the next BPT!